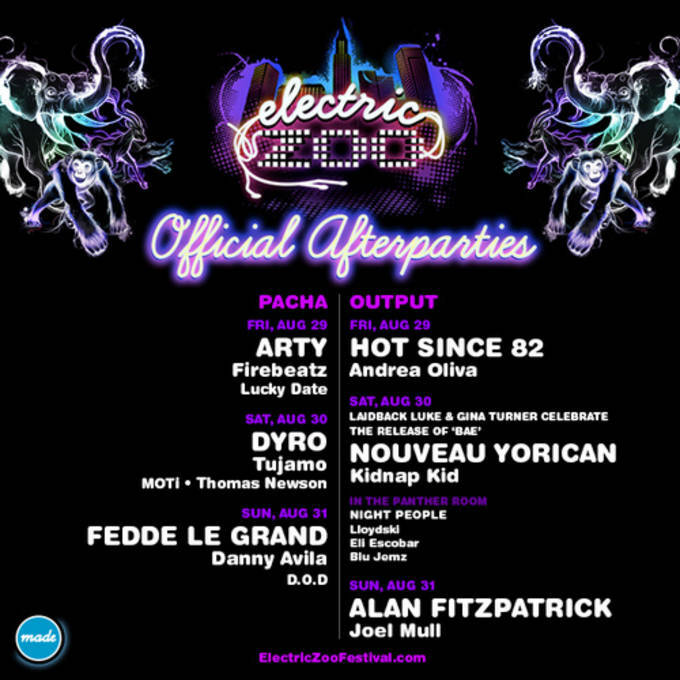 For this year&apos;s Electric Zoo 2014 official afterparties, Made Event has done something pretty ill: they&apos;ve booked dope shows at both Pacha and Output on each of the three nights of the festival, and made it so if you wanted more of the bigger EDM sound, you could hit one venue, while the more subdued, "underground" styles could suit you at the other. So, for example, Arty&apos;s headlining the Friday night afterparty at Pacha, while Hot Since 82 will be taking over Output. Ends up creating a sick dynamic, and should satisfy both sides of the dance music scene looking to hit Electric Zoo this year. Check out the full lineup down below, and snag tickets via donyc.com.